a computer engineer based in Austin, Texas. It's nice to meet you. My name is Alex Ciccone. I'm a computer engineer with interests in quality assurance, data science, web technologies, and embedded systems. I received bachelor's degrees in Computer Engineering and East Asian Languages & Literatures (Japanese) from the University of Florida. 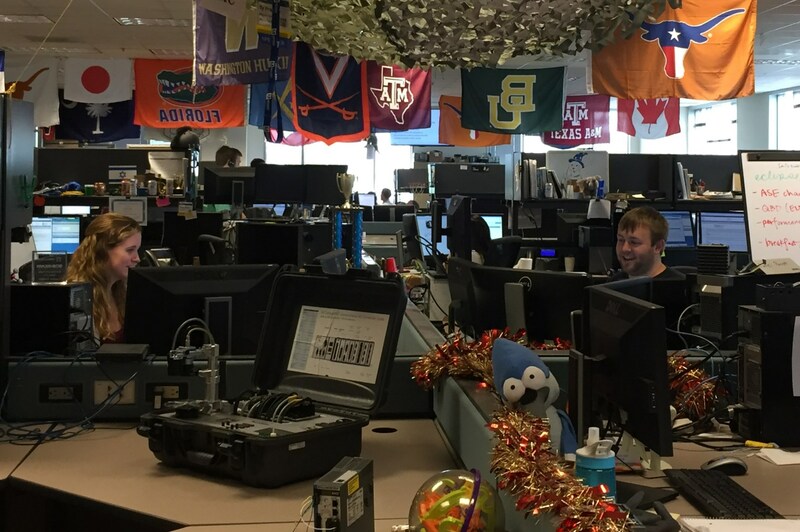 Most recently I had the privilege of working as an Applications Engineer with National Instruments (NI) in Austin, Texas. I learned a great deal about delivering comprehensive and personalized front-line technical support across a wide range of hardware and software suites. I am currently expanding my skill set while searching for a career where I am able to challenge myself and make a positive difference in people's lives. Want to get in touch with me? I would love to hear from you! Feel free to email me at any time. I'll do my best to reply as soon as possible. Here are some highlights from my time at National Instruments, the University of Florida, and Kansai Gaidai University. More personal projects and photos will be added shortly. Last Update: October 11, 2017. My previous position was with National Instruments as an Applications Engineer in their Engineering Leadership Program. My primary responsibility was providing prompt and comprehensive technical support to a variety of clients, including students, engineers, scientists, researchers, and technicians. This support typically involved troubleshooting LabVIEW programs built by the client along with their hardware/software configurations. We often collaborated with R&D to address challenging bugs or limitations in our customers’ systems. We also proactively reached out to our clients to provide them with resources or training to help them be successful in their role with our hardware and software. I enjoyed my time at NI and feel like I made a positive impact on the hundreds of clients I worked with, while also increasing brand loyalty and the adoption of our products and services. I teamed up with my friend and classmate Devin Holland to design and build an automated, wireless toy turret and haptic feedback chair. Our goal was to create a system that was interactive, entertaining, memorable, and fun for the user and any onlookers. Star Command used a vision sensor to identify and track moving objects of various colors while panning and tilting a custom-built (and 3D-printed) arm. An airsoft gun mounted to the arm would then engage the targets with soft, plastic BBs. 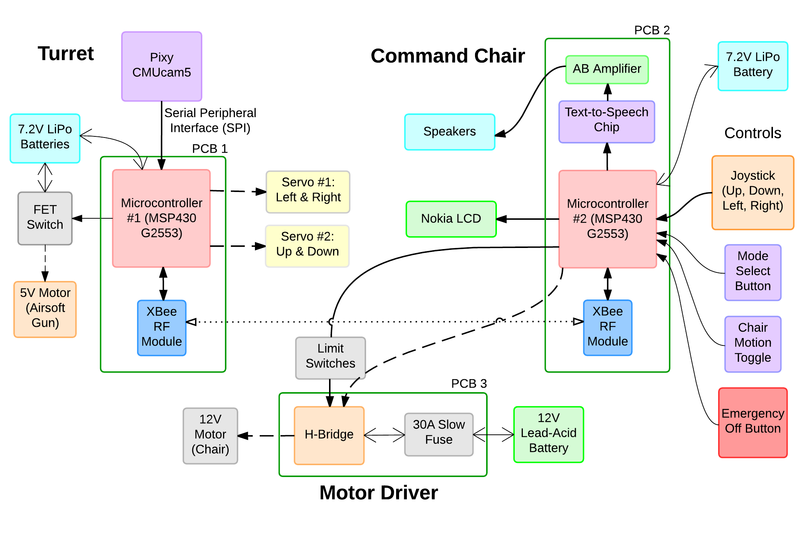 In addition to the automatic mode, the user could also manually control the command chair via a joystick, responsively yawing the chair left and right in tandem with the turret while producing a myriad of audio and visual effects. The project incorporated several custom-designed and milled PCBs and was a hit with our professors and fellow students. For more details and pictures please see our short presentation on Dropbox. I designed and built a robot which played rock-paper-scissors with human opponents using computer vision algorithms and an IP camera to detect hand gestures. 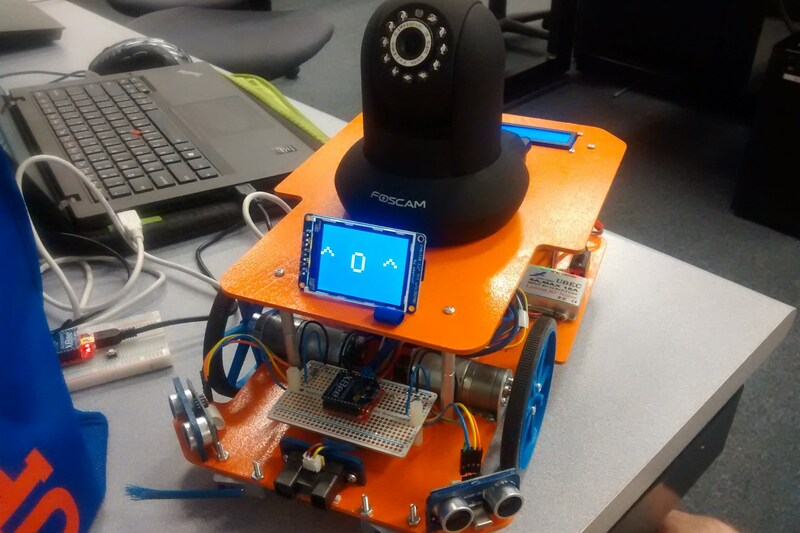 RoshamRobo featured a differential drive and navigated itself autonomously using infrared, ultrasonic, and “whisker” bump sensors controlled by an Arduino microcontroller. Its chassis was designed in SolidWorks and laser cut from balsa wood. XBee RF modules were used for communication between the microcontroller and a laptop (where the intensive image processing occurred). For more details and the source code please see the full report on Dropbox. I attended Kansai Gaidai University in Hirakata-shi, Osaka, Japan for an academic year as an exchange student. 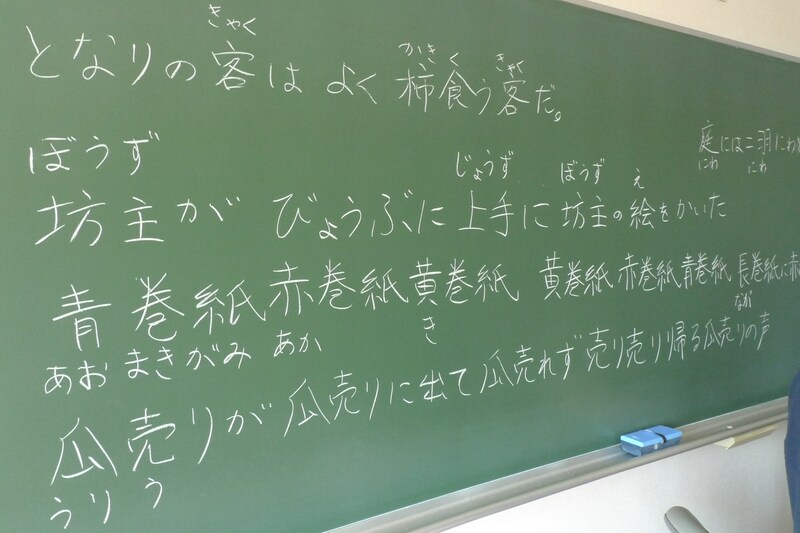 I completed my third year of Japanese language studies there while taking courses in modern Japanese literature, culture, anthropology, and political science. I am very gracious to have spent a semester with a host family, and to have participated in several small student organizations ("circles") including KGU's English Studying Society (英語研究会) and Japanese Sign Language Circle (手話サークル). I maintained a short photo blog during my second semester. Feel free to take a look at Blogger – Tabi no Sora. I am passionate about continuing to learn the Japanese language and developing insights into Japanese culture, society, and history. I am certified to understand Japanese at an upper-intermediate level (having passed the 2nd highest level [N2] of the Japanese-Language Proficiency Test), and am actively working towards an advanced level of understanding through independent study and weekly language classes. Site created by Alex Ciccone. Content licensed under CC BY 4.0.